His name is on a plague on the Eiffel Tower. A street in Paris bears his name. There is even a crater on the moon named after him! Joseph-Louis Lagrange, born Giuseppe Lodovico Lagrangia on 25 January 1736, was a mathematician and astronomer during le Siècle des Lumières, the Age of Enlightenment, an intellectual and philosophical movement in Europe during the 18th century. He was known as a kind and quiet man, who had a life-long devotion to, and passion for, science. Lagrange was born in Turin, Italy. His father was of French descent and his mother was herself born in Turin. His father, who worked as Treasurer of the Office of Public Works and Fortifications in Turin, had decided his son was to have a career as a lawyer. Lagrange attended the University of Turin, seemingly happy with the vocation that had been chosen for him. During the course of his studies he was obliged to complete some mathematical studies, such as geometry, which he found boring (who can blame the guy!). His favourite subject at the time was Latin. But Lagrange's attitude towards maths did an abrupt U-turn after reading a paper by Edmund Halley, after whom a comet was later named (which I was fortunate to see as a teenager). After a year of self-study, he was hooked on maths. And at the age of just 19 (some even say 16!) he was teaching mathematics at the artillery school of Turin. During this time his work focused on 'calculus of variations', which was well received in the mathematical community. By the time Lagrange was 25 in 1761 he was already recognised as one of the greatest living mathematicians. Not bad for a guy who initially thought maths stuff boring! Three years later in 1764 he was the recipient of a prize awarded by the French Academy of Sciences for his essay on the libration of the moon, which is basically the study of the slight wobble or oscillation of the moon, which in turn present to us on Earth a visual change of lunar features. He also worked on theories relating the the motions of the satellites 'moons' of Jupiter. In 1766 Lagrange was offered a teaching post at the Prussian Academy of Sciences in Berlin. He was invited by the king Frederick the Great, who is believed to have said that it is the wish of “the greatest king in Europe” to have “the greatest mathematician in Europe” at his court. While in Berlin he worked tirelessly on the areas such as the 'three-body problem' (which relates to Newton' law of gravity), differential equations, prime number theory. and the mechanics and stability of the solar system, He also devoted much time to the study of algebra, culminating in a long paper published in 1770, titled: Réflexions sur la résolution algébrique des équations (Reflections on the Algebraic Resolution of Equations”). In 1787, after the death of King Fredrick, Lagrange was invited by Louis XVI to take a position at the French Academy of Sciences, which he gladly accepted. In fact, he remained in Paris till the day he died. His move to Paris was right before the French Revolution in 1789. During this turbulent time, Lagrange was, shall we say, prodded into joining the committee working to reform the metric system. then in 1794 the École Centrale des Travaux Publics (later renamed the École Polytechnique) was opened and Lagrange took a position as a leading professor of mathematics. Here Lgrange continued his work on calculus, producing the first analytical textbooks in the area. He also continued work on new edition of his Mécanique analytique, but Lagrange died 10 April 1813 before it was published. On 17 February 1958, France issued a set of four stamps honouring famous scientists. Two of these stamps were designed and engraved by Albert Decaris. 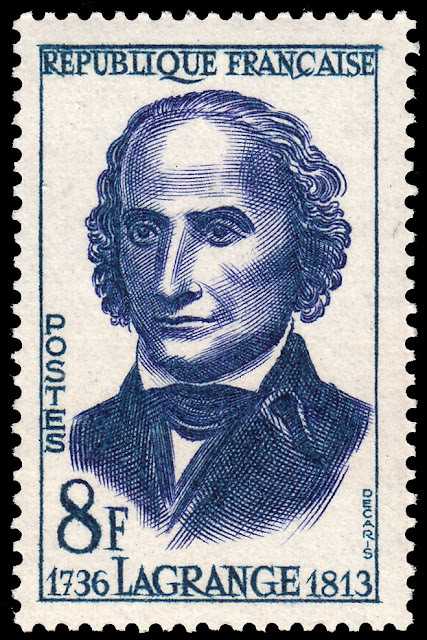 One of these two stamps featured Joseph-Louis Lagrange. it is a lovely design, which captures the true essence of this brilliant, kind, and gentle man.